Hello folks . 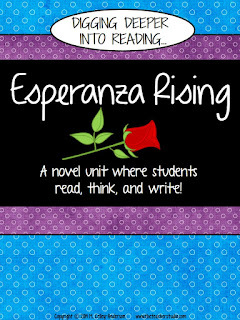 . . taking a break from the fraction posts for a little update on our life in literacy. To be honest, in math today we did some review, practiced using cubes to do some fractions of “sets” . . . it was pretty low key–so . . . Instead, I wanted to chat a little about the historical fiction book groups I am trying this year. We read Sarah, Plain and Tall as a class–with me reading the first and last chapters and the students working in book clubs to read and process the rest. We did some practice responding to prompts and talking about the book in a fairly structured way. 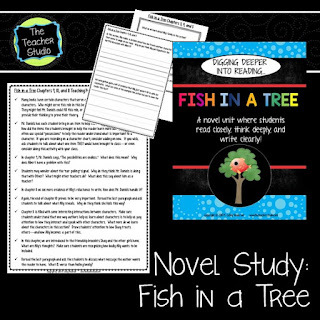 I used a bunch of pages from my Sarah Plain and Tall unit I have for sale–and the writing activities in it showed me I have a LONG way to go with helping them be better “responders” to reading! ( . . . but I already knew that–I can’t lie) So ready to hear why is THIS anchor chart hanging in my room now? After finishing Sarah, Plain and Tall, we refocused our concentration on the elements of historical fiction. We spent a ton of time talking about how the setting affects the story–especially the concept of “era” . . . and how often books are set in a certain “era” and the authors and illustrators give us clues. We talked about life in different eras. . . the colonial days . . . the pioneering days . . . the Civil War era . . . life during the world wars and the Great Depression . . . the fifties . . . and so on. My students literally hung on my words as I told different stories to them to help them develop their understanding of life in this different time periods. We pulled out nonfiction texts to study the era that Sarah lived and we really started to put the pieces together. What have you learned about the character so far? What is a quick overview of the key events of the story to this point? What information have you discovered about the era in which the story takes place? 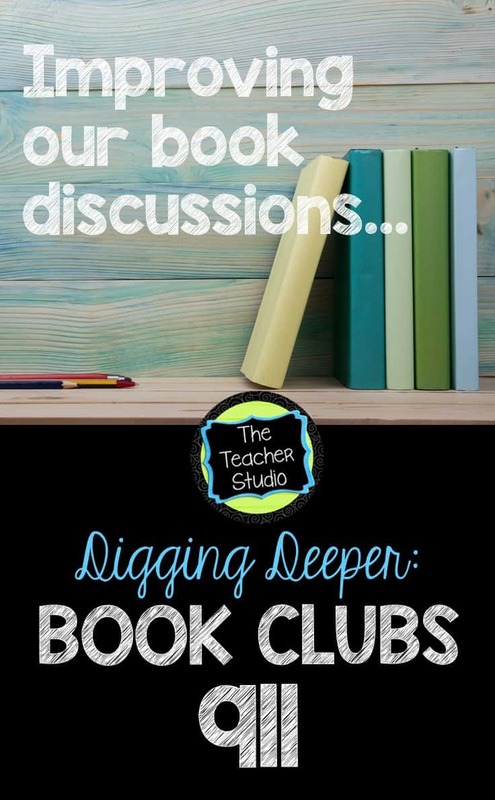 Now, I have to tell you–this is NOT the first time my class has met in groups and NOT the first time we have had book discussions. I had two groups go at a time in separate corners, and I flitted between them listening. I spoke not a word and just waited to see how things would unfold. Let’s just say . . . things didn’t unfold terribly well. I knew I had to do something, but I wasn’t sure what. I considered doing a “Fishbowl” activity where one group could watch another group have a discussion (and we may still do this), but instead, I decided I hadn’t done a decent enough job laying out my expectations. I pulled them together as a group and showed them the following “mental model”. I explained that I was represented by the circle, and they were the X’s. I let them know that sometimes in our class, this is how I taught. I was the leader, and they were the receivers of information. I might ask questions, they might respond–and that’s what the lines represented. I reminded them that it doesn’t happen TOO often, but sometimes this is how the class works. They nodded–they got it. Then I showed them this diagram. I explained that today I saw the book groups operating with this model. A small group of students sat together, one shared, then the next, and so on. In fact, I even heard one student say in a monotone “Neeeeeext!” when he was done sharing. I explained that in this model, it felt as though one person was “reporting” information to the others, but I couldn’t tell if the others were interested or listening at all. A few students chimed in that this was, indeed, what their group was like today. 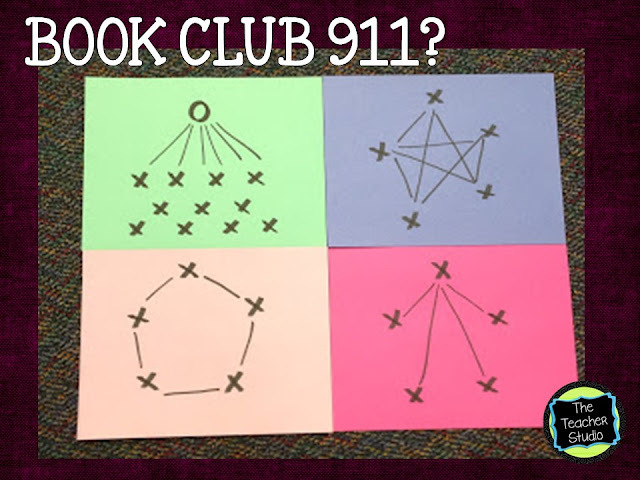 I then showed them yet another diagram of one group I saw working . . .
. . . and we talked about how sometimes one student acts almost like a teacher or a leader in the group. I asked them if they thought this was a good model. We had a nice discussion about how sometimes this model is fantastic–especially if the leader is very knowledgeable and knows how to actively engage everyone in the group. I explained that facilitating a group like this is a really great skill–one that many people need to use in their jobs. One student mentioned that sometimes it feels like leaders in groups are bossy, and others agreed. We continued on with that discussion, and talked about how important it is that everyone in a group work to balance the “power”. I reminded them that they were ALL experts on their book–no one else in the group was! Each of them should have been able to participate fully. I then showed them this model and asked them to think about it and then turn and talk to a neighbor. The students agreed that these sentence starters could help them comment off of other students’ comments, so we practiced a little with a question about Sarah, Plain and Tall. I could see the light bulbs going off, so I am hopeful that our discussions on Friday will be a little more polished. Today was another reminder that these skills we need to expect from our students are NOT innate and are NOT easy for many. They need to be explicitly taught and modeled. Another day, another bit wiser–right? 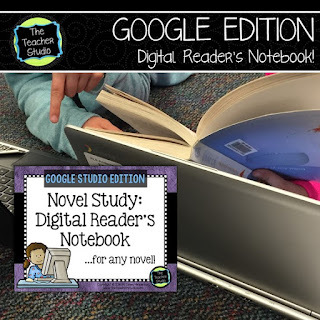 Here is a link to my digital reader’s notebook resource as well as my Sarah, Plain and Tall unit and a few other novel study units if anyone is interested in trying book clubs with something a little more structured. In fact, practicing book clubs with read alouds is a GREAT way to give all students access…no matter what their reading level.